Intertops Poker and Juicy Stakes Casino players will get some extra play time when they deposit this weekend. The casinos are giving up to 100 free spins on the most popular slots from Betsoft. 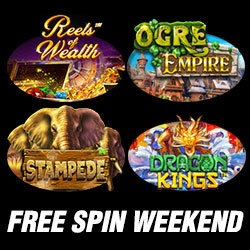 Featured games include the new Dragon Kings slot and players’ current favorite, Ogre Empire. Legends come roaring to life in in the new big screen, high resolution Dragon Kings slot game. Based on Chinese folklore, it features four mythical dragons the rule the seas, each with unique power (from instant prizes to duplicating wilds) that can turn the tide of the game in an instant. Ogre Empire features a Shrek-like giant who terrorizes residents of a fantasy kingdom. An innovative Day/Night cycle switches up gameplay.